Saturday sees one of the world’s richest horse races take place at Meydan, the Dubai world cup. Over the years I’ve moved from dabbling in the Meydan markets to doing them seriously. They often make for a useful addition on a dull Thursday in the UK. I’ll often recommend a dabble in these markets if the volume is holding up and there is no clashing with other races. As for the big race itself, the world cup, it must be one of few where the prize money dwarfs the turnover on Betfair! I once got a fantastic result from this race in 2010. It just happened that everything fell into place perfectly that year, I haven’t replicated the feat since, but usually, pull something useful out of the race and the card this Saturday. That’s why I recommend you have a look. Last year was a little lacklustre, but the prior year was a really interesting market with significant support for Arrogate. 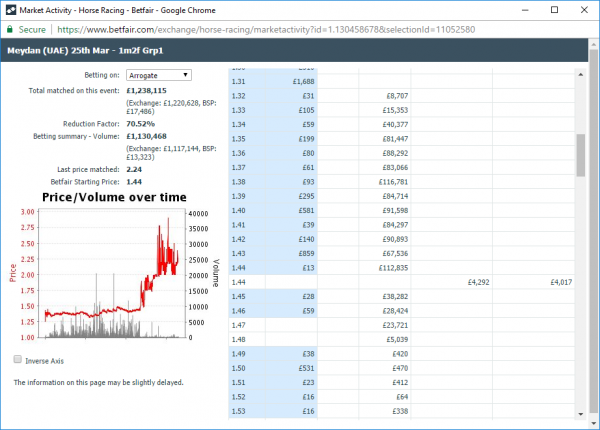 It went off at an SP of 1.44 but drifted significantly before being going on to win. 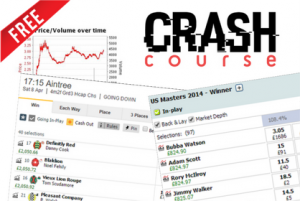 The market often tops £1m in matched betting turnover. The market more competitive this year so I’d expected lower turnover but still large. It’s difficult to know as some years have been higher than others, but based on such a short price generating £1m, I’d pitch my guess slightly lower this year. My experience at Meydan is that it generally produces quite good markets and on this Saturday in particular, some excellent ones. Therefore I suggest you pay extra attention to Meydan this Saturday with a view to spending some time on trading these races in between and sometimes instead of some of the weaker races in the UK. Here is hoping that this year is favourable.